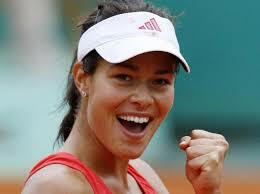 Ana Ivanovic (born November 6, 1987) is a former world no. 1 Serbian tennis player. As of August 6, 2013, she is no. 15 in the Women s Tennis Association (WTA) rankings for singles and unranked in doubles (her career-high ranking in doubles is 50, c. 2006). She beat Dinara Safina to win the 2008 French Open and was the runner-up in singles at the 2007 French Open and the 2008 Australian Open , has qualified for the annual WTA Tour Championships twice (in 2007 and 2008) and has won the year-end WTA Tournament of Champions twice, in 2010 and 2011. Competing as a professional since 2003, she has won 11 WTA Tou r singles titles, including one Grand Slam singles title. As of 2013, Ivanovic has career earnings of over 10.3 million US$. In June 2011, she was named one of the "30 Legends of Women's Tennis: Past, Present and Future" by Time and was also included on the list of Top 100 Greatest Players Ever (male and female combined). View also other tennis players: Anna Kournikova , Caroline Wozniacki , Maria Kirilenko , Maria Sharapova , Serena Williams , Venus Williams , Victoria Azarenka .